Everything Rachael Ray: Express Lane Meals Book Signing Tour - No California! Express Lane Meals Book Signing Tour - No California! 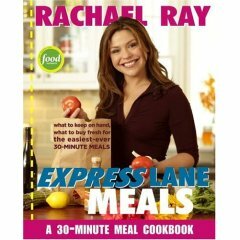 Rachael Ray will embark on a book signing tour for her new book, Express Lane Meals. The tour begins on April 22, 2006, and ends on May 23, 2006. She will be visiting Pennsylvania, New York, Illinois, Ohio, and Missouri. Can you believe she's not coming to California to visit me? Express Lane Meals is set to release on April 18, 2006, and yes, I already pre-ordered it. I think of all the concepts Rachael has used in her books (low-carb, a year of no repeats, parties), this concept most fits with what I am looking for - quick trips to the store and quick recipes. The same theme can be found in the Every Day Kitchen from the magazine, which is a list of ingredients to always keep on hand, then supplement with fresh ingredients as needed. Sounds like a workable plan to me.